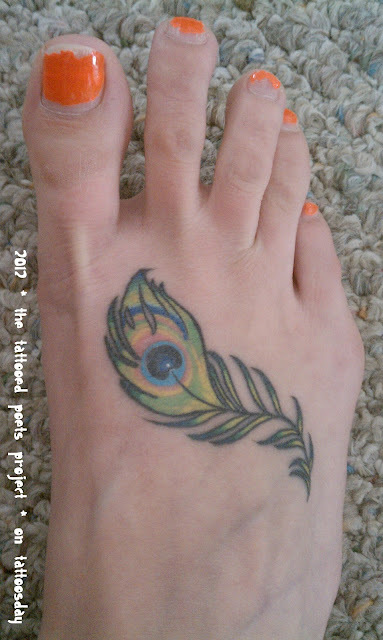 Today's tattooed poet is Laura Goode. 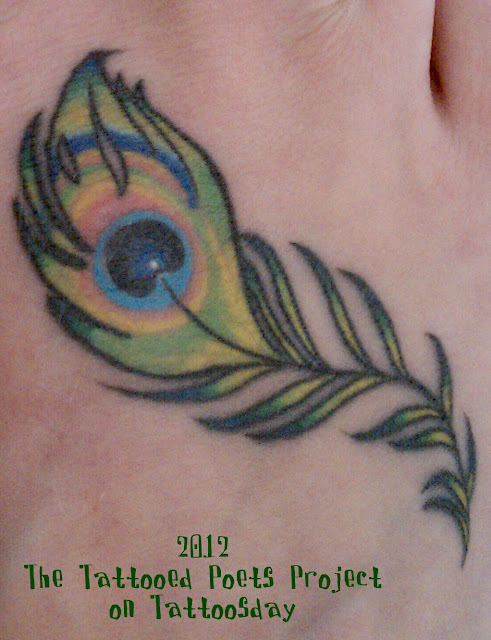 "My newest tattoo, a peacock feather, is an homage of sorts to my friend Jon, who died of cancer on January 20, 2011. Jon’s middle name was Skanda; Skanda is a Hindu god associated with the sword, symbolizing his protection, and the peacock, symbolizing his destruction of the ego. Skanda is often depicted riding around on a magic peacock, and I like to picture Jon doing that now. The particularity of Jon, and the shape and singularity of the hole his absence leaves in my life, was that he was not just friend to me, but more than that, sometimes transcendently, he was collaborator. Our relationship was marked by fervent bursts of art. He starred in, and photographed, the first play I ever wrote. He art-directed my second. He took the author photo for the jacket of my first novel. He was my colleague, my interlocutor, in innumerable conversations about queer theory and Chinese propaganda art and writing and Aphex Twin and, eventually, cancer. He called the Facebook album of my author photos 'Portrait of An Author As A Young Author’s Portrait.' He told me that if there were ever a Lifetime movie made about my life, it would be titled 'Laura Goode: Heart of Gold, Womb of Steel.' During a period of time in our lives marked by wild, leaping growth, Jon wove so many fibers into the fabric of my initiation as an artist. I hope I did the same in his, but I don’t have the luxury of asking him. For all these reasons, it felt appropriate to mark Jon’s impact on my life, as well as the impact of his departure from it, with a work of art. I got the feather at Resurrection in Pasadena with one of my and Jon’s best friends, Meera Menon, who got her own feather for Jon. Afterwards, Meera and I talked about how we experienced the pain of paying homage to him in a skin-abrading way: it doesn’t hurt as much as losing him, I told her I had been thinking. We confided that we both thought the pain brought us somehow closer to Jon, closer to how much pain he had experienced himself. I look at Jon’s feather now, knowing it will walk with me always, and its splashes of wild color, its heady plumage, bring me some of the joy that Jon himself once brought me. As Skanda’s paradoxical peacock illuminates, death destroys the ego, and both the pain of losing Jon and the more literal pain of memorializing him physically have humbled me. In life Jon raised me up to the rafters of the imagination, and in death he brought me back down to earth. The below poem, I think, celebrates both contributions." & the moors have come in. I have so much still to say. to give us back the dead. Laura Goode's interracial gay hip-hop love story for teens, Sister Mischief , was released by Candlewick Press in 2011. Her poems and essays have appeared in The Rumpus, The Los Angeles Review of Books, Feministing, The Faster Times, Boston Review, Denver Quarterly, Dossier, Slope, Fawlt, and other publications. She is currently producing her first feature film, FARAH GOES BANG, co-written with the filmmaker Meera Menon. Laura was raised outside Minneapolis, received her BA and MFA from Columbia University, and now lives in San Francisco; you can follow her on Twitter @lauragoode. Thanks to Laura for sharing her tattoo and poem with us here on Tattoosday!